It's clearly a BB-CA/CLs favoritism mechanic, especially with current rewards/exp based primarily on damage dealt rather than how useful you are to the team. It's a MILLION times harder to keep your star while in DDs than when you are in BBs and CA/CLs (especially Zao and Hindenburg), you all know it, WG know it. It's a freaking unfair rule set that makes the game frustrating for DD mains. I used to have good BB/CA/CLs teammates in the first week of the ranked season, the game was so enjoyable but then as the game proceed, potato BBs/CA/CLs start to creep in and now as a decent DD main, I am dragged in this mess of stupid players. I can deal up to 100k damage but still lost a star because some BBs hang back and get some nice citadels. You can spot 100k damage, hit 1-2 torps, tank torpedoes and still lost star in a DD. The chance that you can keep your star in a loss in a DD is actually smaller than the chance that you can carry the match for the team. It's THAT serious. So WG, please reconsider. It is up to the player to get their star. If the BBs and CAs got good citadel hits, and you got no Torpedo Hits, that is your fault. If you don't get a lot of torpedo hits, that is your fault. If you die in the first three minutes, that is your fault. In the end, it is up to you and only you to get your damage so you can keep and earn your star. My Asashio kept her stars for three battle because I survived and got my torpedo hits. I could actively NOT spotting enemy ships AND go alone in a flank, torping ships so that I can make sure NO ONE in the team can have anything to shoot at. Shall I go that extreme just to prove a point? Because of easy cap points and relatively good XP from shooting red DDs and sinking them? You can go if you want to go. I prefer to SUPPORT my team with my DDs by providing them with a trail of SMOKE so they can fire in. I will go in as close as possible while SPOTTING and TORPEDO my enemies and I will RUNAWAY back into my smoke so that I do not die. I will provide a DISTRACTION so that the enemy fires at me so that they do not fire at my allies. That is what I do. You can do what you want to do but I know how to use my ships and make use of their advantage. Do you know how to make use of yours? Lol what cap point is easy? Imagining going C and hold the cap. Relatively good? very bad compared to damage dealt. That's final. Who says you need to hold it? Move on to the next objective. much easier to keep stars in DD. I have kept my star in about 80% of ranked losses. You should probably get familiar with game mechanics and how caps work instead of complaining about BBs. I have a feeling you are one of the DDs that flees to the far corners of the map, far away from the caps. If you are only hitting 1 or 2 torpedos... that is awful. I would go back to maybe tier 2 or tier 3 and learn the basics. You are probably new to WoWs and don't realize there is more to it then sailing around looking at the pretty ocean. Oh, well I guess that depends on player skill and what reds decide to come to the cap you went to. Like if you take out 2 full HP DDs as a DD and get 2 caps, you're basically set. It is a relatively easy ordeal if you know how to play DDs and bring a proper DD to contest caps. Kidd, Loyang, Harekaze, etc. In every past season of rank saving stars was almost an exclusive activity of destroyers. To save a star in a battleship it would take like 4 full HP to 0 kills. To do it in a DD would take like 2 captures and 10,000 damage to an enemy DD. OP says it's a BB mechanism and calls people trolls for disagreeing. I think I'm going to have to call "low information poster." That's a polite way of saying anything from jackwagon to complete and utterly incompetent moron who is just upset about being bad and not getting to win for sucking. From my experience, it looks like "keep a star for top performing when you lose" was already removed. I'm particularly salty about this game. Our North Carolina had a prime opportunity to win-- He was 7km from the Atago (which had less than 1k hp) and 6km from the bow-on Alabama. So you'd expect him to spike the Atago and ram the Alabama, right? Double kill, victory, everyone hails the conquering hero? Instead, he changed targets, bounced his salvo off Alabama, turned to avoid ramming, got wrecked, and left our Edinburgh in a 2v1 with a mostly intact Alabama and an Atago that ran into hiding as soon as he could. 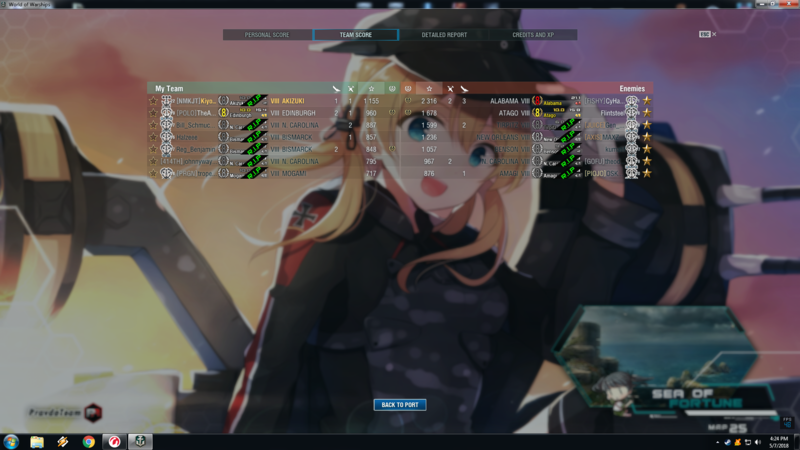 Our NC threw the match for no goddamn reason. In every past season of rank saving starts was almost an exclusive activity of destroyers. To save a star in a battleship it would take like 4 full HP to 0 kills. To do it in a DD would take like 2 captures and 10,000 damage to an any DD. I think I'm going to have to call "low information poster." That's a polite way of saying anything from [edited] to complete and utterly incompetent moron who is just [edited] about being bad and not getting to win for sucking. Many Posts have been written about this. Ive lead the losing team in DDs, CAs and BBs. It doesnt seem like it favors any particular ship. TBH im probably an average player and have no problem coming in first on a losing team no matter what ship im in. Maybe OP was one of those DDs that I had in game that was playing behind cruisers and just shooting torps every 1:30 and not really capping or spotting anything the cruiser didnt already spot. No clue, he does not say what Destroyer he is in or how he is playing. He may well be doing what you described. Shall I go that extreme just to prove a point? And so if you remove the keeping-the-1-star from the game what is the incentive to try and salvage a losing team? With how close I am willing to get, it means my torpedoes are more likely to hit, and if we lose I keep my own star. Support supports support in supporting the support that is supporting support while supporting support. That is how you win... or at least how you keep your star. But you suggested that torping ships would help you keep a star. I mean, you can just continue complaining, too. Up to you.